Under Utho Jago Yuva Abhiyan YOUTH WORKSHOP was organised in Bilaspur on 18th October 2016. In this workshop main speakers were Ma. 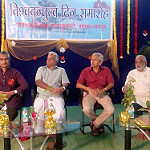 Bhanudasji, General Secretary of Vivekananda Kendra, Prof. Anjila Gupta, VC GGU, Vishisht Atithi- Dr. Ulhas Ware Pradesh Saiyojak Utho jaogo pratiyogita and Prof. BN Tiwary Ragistar GGU. Ma. Kishorji, Joint Gen. Secretary & Sushri Rachna Didi Madhyaprant Sangthak were also present during the workshop, which was ogranised under able leadership of Shri Kuldip, Nagar Sangathak of Bilaspur. The function was held by Sri Ashutsoh, Nagar Yuva pramukh of VK Bilaspur. The program were started with three Omkar and prayer followed by Kendra Parichay and after Vivek Wani and Patriotic Song, Ma. Bhanudasji guided the youths. The next session of workdhop is about interactive activity like Games and Group Discussion, which followed by the presentation group-wise. 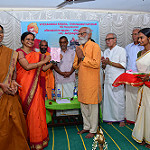 The book release function of the Malayalam translation of a well famous book, "YOGA - The Way of Life based on the Vision of Oneness" has been held at Thiruvanthapuram, Kerala. Shri Hanumanth Rao, Chief Mentor of the Yoga Certificate Course by Vivekananda Kendra, Kanyakumari was specially present at this occasion. We are happy and obliged to send you the activity report conducted by VKRDP. The details of our activities, for the month of September 2016, are listed for your ready reference and kind information. 1. “Sri Rama Jaya Rama” Mantra was chanted during Deepa Pooja, Shivalinga Pooja and daily by our Balwadi school children, cultural class students and during monthly meetings by our Balwadi teachers and Social Workers. Every month nearly 8, 12,718 times mantras were chanted in 84 localities. 2. Through 73 Balwadis, 1,842 rural Children were nurtured. In all the Balwadis, Malt along with hygienically prepared highly nutritive lunch with vegetables was served during the day. And in the evening vitamin-rich cereals were provided to the children. 3. In our Medicare Programme, 1798 patients were examined and treated for various common ailments, through 14 Rural Medical Centers in Kanyakumari, Nellai and Thoothukudi districts. 4. In 165 Samskara Vargas, 6317 students participated. The students were taught about the values of Indian Culture, through games, lectures & lessons. The feelings of oneness were strengthened among participants, through patriotic songs and games. 5. Under Adopt a Grannie Programme, 31 destitute and old people were provided with monthly solatiums, in the form of rice, dhal, oil, etc., for their livelihood and 104 persons provided rice only, in Southern four districts of Tamilnadu. 6. Monthly Deepa poojas were organized in 204 village temples in five districts of Southern Tamilnadu, in which 8619 ladies participated and offered prayers for the welfare of self, family and the society. 7. Under Amrita Surabhi Scheme, our Kendra workers collected 1366 Kgs of rice from five districts. 9. Vivekavani Subscriptions for 271 three years one and 9 Yuva Bharathi were collected. 10. 80 women are being benefited in 4 Self Help Groups in Kanyakumari district. 12. 4 tailoring units are functioning well in Nellai & Kanyakumari districts with the total attendance of 81. 13. Shivalinga Poojas were conducted at 03 places in Kanyakumari District and 160 members participated. 14. Durga Pooja was conducted at 03 places, in Kanyakumari District in which 181 devotees participated. 15. Eye camps were conducted at 4 places, in Kanyakumari, Nellai and Thoothukudi districts in which 781 were treated for their eye ailments and 123 unter went cataract operation. 104 persons were given eye medicines and 32 persons were given spectacles. 16. 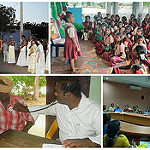 Parents meeting was conducted at 8 places in Kanyakumari district and 298 persons participated. 18. 1008 deepa pooja was conducted in Kommadikottai in Thoothukudi district where 1295 people from 67 villages participated. 19. 2007 deepa pooja conducted at Rameshwaram in Ramnad district where 2469 people from 120 villages participated. Before Pooja in Mathru Sammelan Bhajans & inacting performed and by our workers and Sri.HanumanthaRao - All India Treasurer V.K.- Kanyakumari blessed the audians. 20. On September 5th Vinayagar chadurthi & memorial day of Mannaneeya Eknadji’s programme observed at Kanyakumari, and Annadhana distributed to nearly 1000 people. In Thoothukudi RDP office “Viveka Vinayagar” chadurthi function conductedand prasatham distributed to the devotees. 21. Universal Brotherhood day - celebrated on 11.09.2016 in 34 places in southern five districts and nearly 1780 people participated. 22. On 08/09/2016 in memory of Shri Ramadhas sweets were distibuted to 249 children in 8 balwadis from Tirunelveli districts. 23. Three days workshop conducted on creative teaching moduls for Creche. Supervisors / Teachers from 19.09.2016 to 21.09.2016 in Kanyakumari where 35 teachers and supervisors attended. Janakipushpam – Vallioor – Tirunelveli District. Thiru M.Ramesh, Thambaram, Chennai is a well wisher of Kendra and itsservices. Every year he donates for adopting elder citizens who have no dependants. Mr.Ramesh belongs to Middle class family. The recent rain – disastermade him lost everything he had earned. Hence I didn’t approach him for donation. But he had sent the amount without buying anything for his own. His service is a valuable one and it impressed me a lot. 8 children belonging to ‘Narikkuravar’ group are coming to our Creche. Their attendance is not regular. They will come regularly for few days and absent for few days. Nowadays I get down from the bus at Villukuri and go to their place tofetch them. I will be waiting till they get ready. After coming to the Creche I take special care to make them know good habits. After three days I asked them about the good habits. A child named Muniasamy recalled everything and recited ‘Early to Rise’ ‘Early to bed’. Then only I have realized that with in 3 days the kids have developed a lot. Our efforts have some effects in them and I am contented and encouraged to do more for them. Usually we take our Creche children for Medical check – up to the Siddha centre in our place. They will give medicines for cold, fever and a few other common problems. We gave the children those medicines with proper instruction to their parents. Two kids – Kavi Bharathi and Kaviyazhini are studying in our Creche. One day I received a call from their father in the night. Somewhat hesitated I attended the phone. He told me that his daughters were suffering from service cold and fever. Though we took them to the doctor for two days, there was noimprovement. The medicine sent by you last month gave them quick cure. He also asked me whether I was much impressed him that siddha medicine then. I was much impressed and felt very happy about my concern and the parent’s approach. Open book examination was conducted at Government Engineering College and VPMP Polytechnic in Gandhinagar under Safal Yuva Samarth Bharat programme. Total no of 150 students participated in examination. One day youth motivational camp was organized on the 15th October, 2016 at Government Engineering College, sector 28, Gandhinagar. Total no of 103 students participated in the camp. Games, Songs, Suryanamaskar, Inspirational Lectures, songs Group Discussion were main activities of the camp. 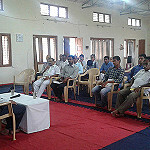 Dr Kamleshbhai Upadhyay delivered an inspirational talk to the students. He requested students to be a contributive personality of the society. Total no of 16 karyakartas were present in the organizing team. Vivekananda Kendra - Telugu Praant organised the 4th Praant Karyakarta Prashikshan Shibir from 1-7 October, 2016 at VK Kaushalam, Hyderabad, with six participants and five karyakartas in the organising team. In addition to the regular conceptual sessions, two Yoga Pratimaans Pareeksha de Hastei Hastei and Tejas were introduced.